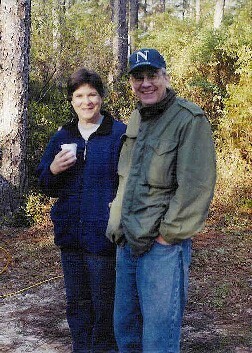 Holt, FL--The Fellow Travelers met near Munson, Florida, to begin three days of canoeing on the streams of the Blackwater Forest. Donald May, Glenn Tankersley, and Charlie Stines took the Suburban Profane to meet Greg Baker , Arthur Tucker, Art and Janice Shelfer, and George and Carol Royal for the first day of canoeing on Sweetwater and Juniper Creeks. 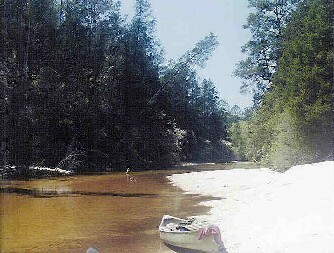 Since the plan was to camp at the Blackwater River State Park, the canoes were not burdened with camping gear, and that proved to be a godsend. Put-in was off Sandy Landing Road, and then it was down the Sweetwater. Putting it mildly, Sweetwater Creek was a chore. The creek is shallow, narrow, and relatively swift. The first pull-over was in sight of the put-in, and there was no point in counting the number to follow. Arthur and Glenn were in Arthur's sixties vintage Sears Elgin fiberglass canoe, and it must weigh at least a hundred pounds. Pulling the canoe over logs and carrying it around obstructions taxed the muscles of the aging crowd. Greg took his brand-new Bell Magic solo for its maiden voyage, but by the time it had d ragged over the gravel stream bottom it looked like a veteran by the end of the day. George and Carol made their rookie trip in Paul Tabor's Mohawk, and the truth is they did very well. Art and Janice took Art's Discovery 169. Donald paddled his kayak. Despite all the getting in and out and carrying the canoes, Janice did not even get her feet wet. She certainly has that Homecoming Queen demeanor. Charlie soloed the Penobscot 16. 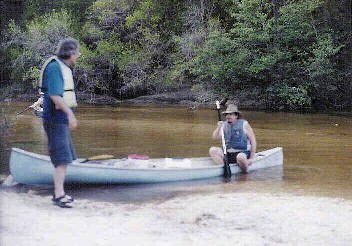 The first two miles of canoeing was on the Sweetwater. It was nearly three o'clock by the time the travelers reached the junction of Juniper Creek. By that time, everyone was bushed. Juniper Creek was quite a contrast. 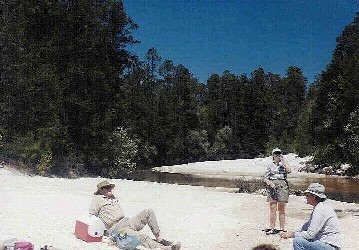 Whereas the Sweetwater had high banks and no sandbars, the Juniper did have lots of sandbars. The current remained strong, but there were no real pull-overs. Glenn and Arthur fell seriously behind, so Greg decided to wait for them. Eventually he paddled upstream to meet the defeated duo. He found that Arthur had fallen out of the canoe and lost his paddle. 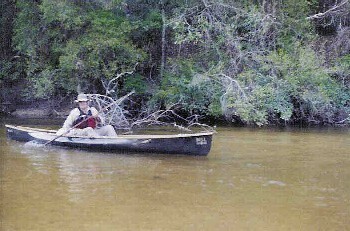 Greg lent his paddle and found a pole to navigate his Magic downstream. The other paddlers reached Red Rock Landing in good shape. No vehicle at been left there since the group had anticipated easily making it to then next bridge. Fortunately, there was a nice commercial pilot at the landing. He was tak ing photographs of the wildflowers. The pilot took Donald to the next landing to retrieve the Suburban Profane. Once Donald returned with the car and trailer, all the canoes were loaded. There was still no hint as to the whereabouts of Glenn, Arthur, and Greg. It was about two hours before they finally arrived. Greg was poling the Magic, and Glenn and Arthur were paddling Arthur's boat. After loading up, everyone went back to the put-in and it was time to drive to the state park. The weather had been ideal for paddling, but the temperature was really playing April Fool by the time everyone arrived at the park. The group had rented the picnic pavilion, but had not inquired in advance about the electricity at the pavilion. There was none, so the considerable sum spent on the shelter was wasted. D iane had driven the 4 Runner to the park, and she had prepared a nice meal of ham tetrazini, green beans, and salad. It was a tasty supper. The group then made homemade strawberry ice cream, but the weather made it something less than a treat. Margie Massey, Donna Kelly, John Williams, and Carla Pollock joined the group for supper. Dan DeBrita was supposed to bring some firewood, but he failed to show. He was sorely missed, but there was a small, smoky campfire. The tents were pitched, and everyone went to bed. Several elected to spend the night in vehicles. The temperature dipped to the high thirties. Donald May prepared breakfast. He had eggs, Jones Country sausage, and Pavo grits. Donald was quick to point out that his eggs were yellow, unlike the generally gray eggs the King usually prepares. Friday's trip was on Coldwater Creek. Glenn wimped out and stayed at the camp. Janice and Art again partnered, as did Carol and George. Greg soloed his Magic, and Donald again kayaked. John and Arthur paddled Donald's Mohawk. Charlie, Diane, and Carla took the Penobscot 16. Diane had seen the pictures from a previous trip, so she made certain that she took the middle seat and the Playmate was up front. Donna and Margie paddled Charlie's Canadienne. At the put-in Carla noticed that there was a lot of graffiti on the pilings. She lamented the fact that her name had never been written white trash style on a bridge. Art remedied that by writing "Carla is Cool" on the bridge. Carla thought it was a compliment, but actually she had forgotten that Art is the Weatherman and that the writing was simply a weather report. Everyone was a bit cool. Coldwater Creek was beautiful. Again, the water was shallow and the current fast. There were no real obstructions, and there were plenty of spots to get out of the canoe for stretch breaks. There were some high banks and some sandbars. The canoeing was so easy that even Glenn could probably have had fun. There were a few dunkings, but none were in more than knee-deep water. Greg's Magic picked up additional scratches from the gravel bottom. The travelers had learned from the previous day to have a vehicle at each landing. Take-out was at Berrydale Bridge. The entire distance was nine miles, and it was a totally pleasant paddle. After loaidng the trailer, the other vehicles were gathered and it was back to the park for supper. Art and Greg really outdid themselves for supper by frying a turkey. After eating the meat and trimmings, the left-over ice cream was refrozen, and it was much better Friday night than it had been on Thursday. Margie and Donna left before eating. The night temperature was still cold. Since Dan had not arrived there was no fire, but everyone stood around the turkey frier to warm hands. Margie and Donna had left a breakfast of numerous sweet rolls and cereals. The original plan had been to canoe a section of the Blackwater River on Saturday, but the group decided to do the final stretch of Juniper Creek instead. Art and Janice and George and Carol needed to leave and skip the Saturday journey. Diane and Glenn decided to leave after breakfast, so Charlie and Arthur took the Penobscot 16. Donald and Greg again soloed their boats. John took the Playmate in Donald's Mohawk. The canoeing was beautiful and easy. The scenery was much like that of the first section of the Juniper, which is to say splendid. Take-out was reached before one. The shuttle was a short one, and everyone loaded the boats and went home. Charlie and Donald stopped by Richardson's Barbecue in Iron City for supper. Charlie called Diane and found that the 4 Runner had overheated in Tallahassee. Diane borrowed her mother's car and they drove it to Moultrie. After returning home, Charlie had to return to Tallahassee to return the borrowed car. On Sunday, he again went to Tallahassee and replaced a busted radiator hose on the Toyota. It was a neat trip, but the Fellow Travelers will not recommend Sweetwater Creek. At low water it is one pull-over after another. At higher waters, these same obstructions would probably be made worse by being in deeper water with even swifter current.